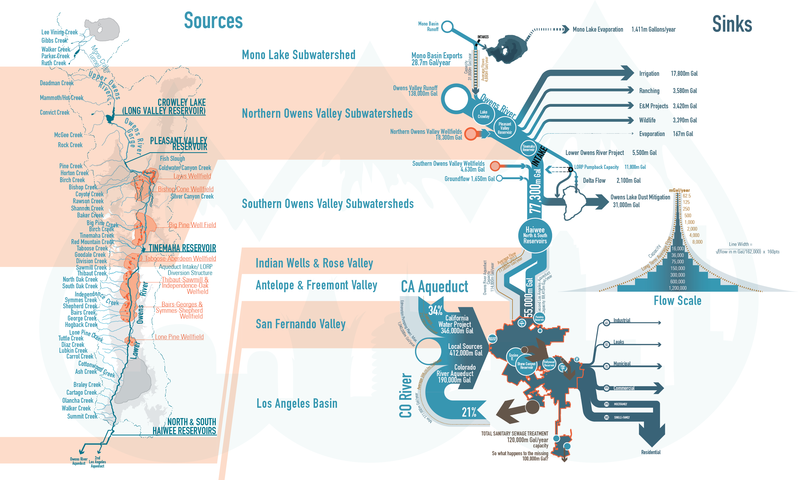 The diagram above maps the average water flows through the Los Angeles Aqueduct from 2003-2013. This is a subset of the 150 years of water data that has been aggregated by the Aqueduct Futures project from historic & contemporary sources for Los Angeles, Inyo County, and Mono County. Clicking the image will enlarge the diagram, and demonstrate where water is being extracted throughout Owens Valley, where our other water-sources are coming from, and how it is all being used (or wasted) as it makes its way into Los Angeles.